Percent: Keep a random percentage of the total quantity of nodes in the current selection. Step: Performs a skip pattern in the selection. Subtract: Same as percent, but inverse: deselect a random percentage within selection. 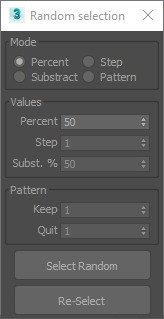 Pattern: Not a random mode; Instead it wil unselect nodes following a pattern. Note: The tool will respect the selection pick order. Quit: Quantity of objects that will be deselected.